When plunger is retracted the mechanism is partly shrouded. Defined thread length by an undercut at the end of the thread. Used in applications where the plunger must not protrude continually. To achieve this, the knob is rotated by 90 degree after being retracted. The head of the plunger body is provided with a suitable notch in opposite positions so as to prevent the plunger from accidentally slipping back into its forward position due to error or vibration. This indexing plunger has the unique feature of the pull knob partially enclosing the top of the plunger body, allowing less debris to enter into the mechanism. 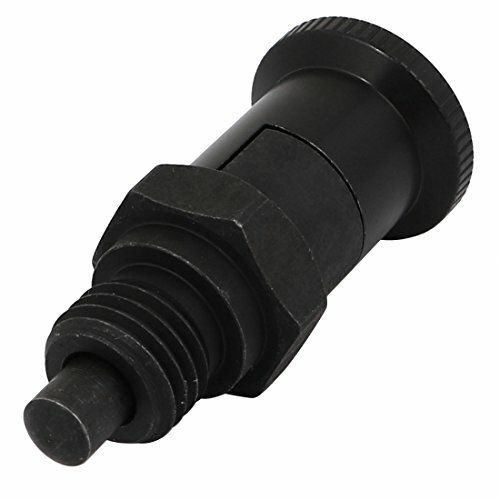 Pin Diameter: 6mm / 0.24"; Thread Diameter: M12; Thread Length: 7mm / 0.28"
Knob Diameter: 20mm / 0.79"; Total Length: 46mm / 1.81"
Finish: Black Oxide; Pin Length: 6mm / 0.24"